Poetry Friday--"Drinking Alone with the Moon"
Text of "Drinking Alone with the Moon," courtesy Wikimedia Commons. The poem should be read from right to left. I sing--the moon moves to and fro. I dance--my shadow leaps and sways. Drunk--and we'll go our separate ways. Interestingly, there's a web page that has 32 translations of the poem. If you'd like to see the effect a translation has on your reception of a poem, or would like to study the art of translation, then this is the place to go! Most surprisingly, there's a translation of the poem by Vikram Seth dated 2001, that differs significantly from the translation above which is from 1992! Tomorrow we will be having a Chinese New Year's celebration here at the Library at 1:00 pm. Happy New Year to you all! There's plenty more poetry to explore at the Round-Up being held at The Miss Rumphius Effect. January 31st marks the Chinese New Year of the Horse, and the Library is gearing up for a big celebration that will be taking place on Saturday, starting at 1:00 pm. We have a colorful display in the case near the front door, which includes books, apparel, and other objects that you might see at a Chinese New Year festival. 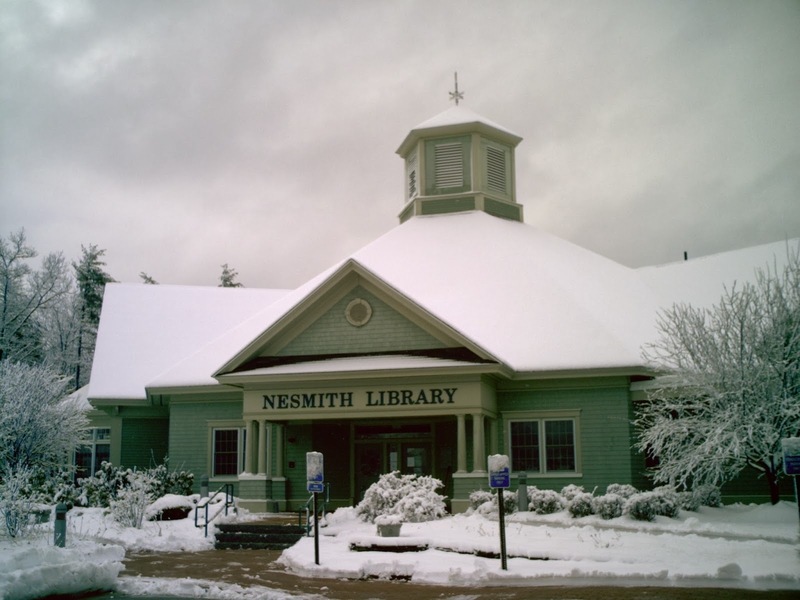 At the Nesmith Library Chinese New Year celebration, participants will hear about the history of the holiday, learn a children's New Year song, listen to the Erhu Ensemble featuring traditional Chinese instruments, be wowed by a martial arts demonstration, watch not one, but two authentic Lion Dances performed in full costume, make a craft, and enjoy a few snacks! It's a activity-packed afternoon for the whole family. No registration is required for Saturday's festivities, but be sure to arrive on time so as not to miss anything! No, this is not a traditional Chinese New Year's symbol! This is our children's room Christmas tree redecorated for the Year of the Horse AND Valentine's Day! How much do you know about the cup of coffee you crave upon waking? Click here to view a very long infographic, "Where does coffee come from where coffee comes from? A journey from bean to cup." Coffee has a long history that, believe it or not, began before the first Dunkin' Donuts opened back in 1950 in Quincy, MA! Uncommon Grounds: The History of Coffee and How It Transformed Our World by Mark Pendergrast [641.3 PEN] reveals nearly all in 520 pages! The Book of Tea & Coffee by Sarah Jane Evans [641.2 EVA] has a more abbreviated history and also tells you how to brew the perfect cup. And, what good is a cup of coffee without something delicious to accompany it? Make one of the recipes in Carole Walter's Great Coffee Cakes, Sticky Buns, Muffins & More: 200 Anytime Treats and Special Sweets for Morning to Midnight [641.815 WAL]. If you have concerns about caffeine, some of your questions may be answered by a fact sheet from the National Institutes of Health. New Hampshire Goes to the Olympics! Congratulations to NH's Julia Krass for earning a place on the Team USA skiing team! Julia hails from Hanover. Make sure to watch when she competes in Sochi! Women's freestyle events begin on February 10. Check the schedule of televised events here. 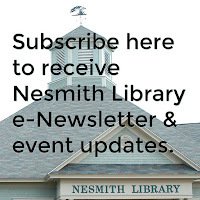 Did you know that the Library carries a subscription to Ski Magazine [MAG SKI]? The magazine is published 7 times a year and is full of current information about the sport. It's been a while since I shared a cat poem with the Poetry Friday readers--it is time to remedy that! For today I'm sharing a exceedingly relevant poem for this time of year. 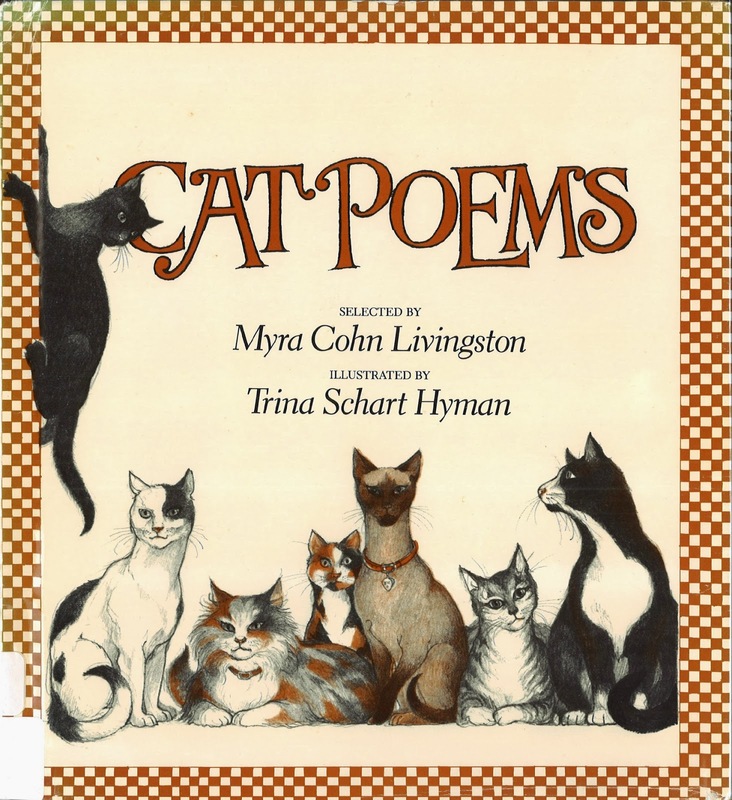 It is taken from an older collection  titled, Cat Poems, selected by Myra Cohn Livingston and illustrated by one of NH's great illustrators, the late Trina Schart Hyman. his perch is piled, is a pillow. Insects are flying, fainting down. to bat one against the pane. The book has many more, equally delightful, poems about my favorite animal! How many cats have been celebrated by poets? I would suggest you stop by the Round-Up at A Teaching Life where you may find another! Understanding and counting calories is often easier to do if you have someone, or something like a book, to guide you. 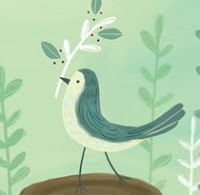 Last week I posted a video of illustrator Melissa Sweet's process. Today I want to share author/illustrator, Peter Brown's process. We have a number of Brown's picture books in our collection [all JP BRO] including Mr. Tiger Goes Wild, and these others: Chowder, The Curious Garden, and You Will Be My Friend! From what I've heard, Mr. Tiger Goes Wild is a strong contender for this year's Caldecott Award to be announced next week. Brown's Creepy Carrots, written by Aaron Reynolds [JP REY] was a 2013 Caldecott Honor book. Last week, the nominated titles for the 2014 Academy Awards were announced. A complete list of the nominees can be found here. The awards ceremony will be broadcast on Sunday, March 2, at 7:00 pm. Would have plenty of time to watch the movies if you're so inclined, however, most of the films are still in theaters, so you won't be able to borrow a library DVD! But, here's an idea--read the books upon which some of these "best" film nominees were based. American Hustle was supposedly loosely based on The Sting Man by Robert W. Greene. We don't own a copy of this title, but it has been ordered, so checked the new books shelf in a few weeks' time. 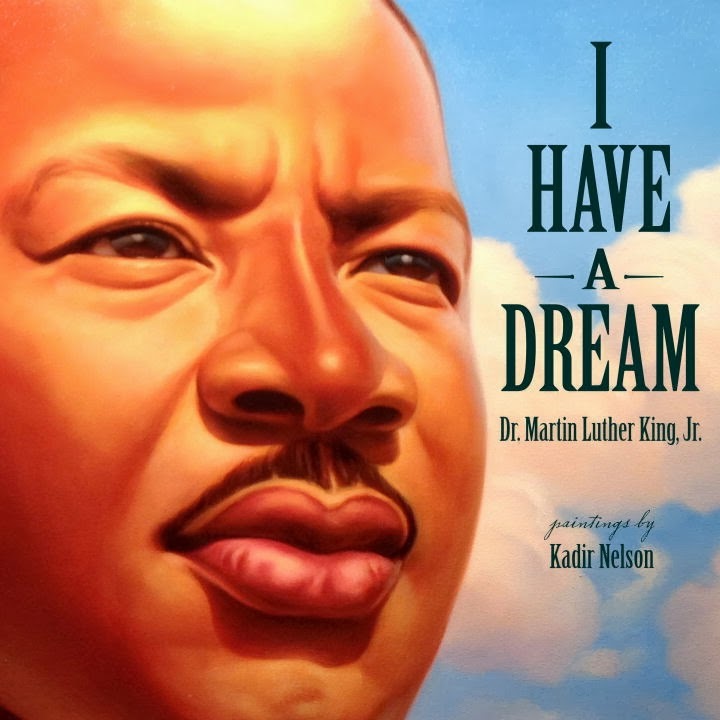 The Library is closed today for the Martin Luther King Day holiday. We will open again tomorrow at 9:00 am. Remember, with your library card you are able to download ebooks to your computer, ereader, or device, any time, day or night, or holidays! 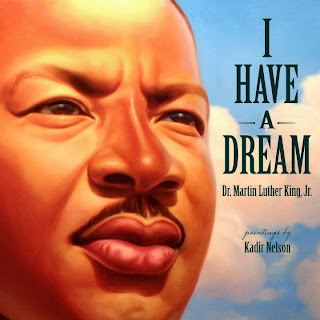 De Kay, James T. Meet Martin Luther King, Jr.
Duhigg, Charles. The Power of Habit: Why We Do What We Do in Life and Business. King, Martin Luther, Jr. I Have a Dream. Aimless Love: New and Selected Poems is the latest collection by Billy Collins [811.54 COL]. Collins is a poetry rock-star, if there is such a thing. Next to Mary Oliver, he is probably the best selling contemporary American poet. That is really faint praise, since if you asked the man-on-the-street, "Who is Billy Collins? ", I'd bet you might get one out of a hundred who would say, "A poet." That's too bad, because his poetry is really accessible. What makes it accessible? Reading one of his poems is like Collins is sitting at a kitchen table and having a conversation with you. Photo of Rita Dove and Billy Collins taken by me at the Dodge Poetry Festival in 2010. If you disregard the stage setting, you can imagine they're just sitting around having a conversation. Due to my distance from the stage, that's about as clear an image as was possible! Wasn't that fun? For more poetry fun, head over to Keri Recommends for the Poetry Friday Round-Up. You've probably heard the term, "graphic novel." A graphic novel is a story told primarily through pictures. And just like a regular novel, the story can be mystery fiction, historical fiction, speculative fiction, or some other genre. For kids and teens, a graphic novel is just a different way of reading. Here are some newer graphic novels that are in our collection: Boxers by Gene Luen Yang [YA CX YAN] is a story about the Boxer Rebellion, which took place in China 1899-1901. Hercules Fights the Nemean Lion by Gary Jeffrey [J CX JEF] recreates the mythical Greek character, Hercules. Waluk by Emilio Ruiz [J CX RUI] is a survival story as well as an environmental story. Nothing Can Possibly Go Wrong by Prudence Shen & Faith Erin Hicks [YA CX SHE] is a typical school story with sports, cheerleaders, and class elections. This is only a small sampling of the large and growing larger collection of graphic novels at the Nesmith Library. We have hundreds more! Illustrator, Melissa Sweet, lives in Maine and was recently interviewed by her local television station, WCSH in Portland, about her process in illustrating children's books. The interview is an interesting look at the work of one illustrator, and also dispels some myths about children's book publishing, such as, the writer must find his/her own illustrator, or, that the writer and illustrator work as a team. We own a copy of Little Red Writing by Joan Holub, with pictures by Melissa Sweet [JP HOL, also in 3M ebook] if you'd like to take a look at the finished project! When you read the title of this post, "Show Jumping," did you automatically think of horses? Well, there is at least one other type of show jumping--RABBITS! If you have a house rabbit, then you now have something else with which to amuse yourself and your bunny! If you don't have a house rabbit, maybe you'd want to consider getting one. If so, look for A House Rabbit Primer: Understanding and Caring for Your Companion Rabbit by Lucile C. Moore [636.932 MOO]. 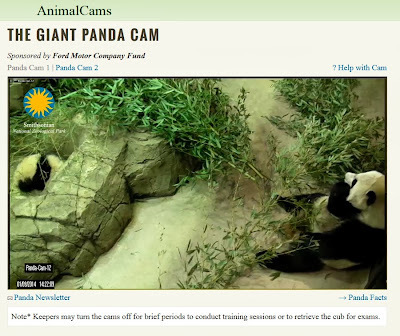 Have you noticed an abundance of live cam (camera) or webcam online sites that enable you to keep track of activities around the world? For example, there are the Statue of Liberty cams that allow you watch the goings-on in the New York-New Jersey harbor area, as well as around the Statue of Liberty itself. In New Hampshire we have the Mt. Washington Observatory cams that gives you an idea of how lucky we are to be in the lowlands during this cold spell! Probably even colder is the webcam from the South Pole! Brrrrr! Cams that follow the lives of creatures both large, like the Giant Panda cam at the National Zoo, and small, like birds, can provide hours of fascinating viewing. Or not--one thing to keep in mind is that if you are awake and looking to watch an Italian kestral, it may be the middle of the night in Foligno, Italy where the webcam is set up! An interesting live cam is the one set up on Abbey Road, home of the Beatles recording studio! However, depending on the time of day, it may be like watching paint dry! Still, it could be fun to borrow the Beatles CD, Abbey Road [CD ROCK BEA], to play in the background while you watch! 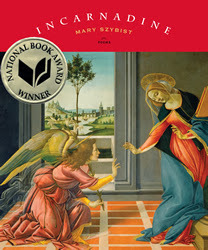 The National Book Award in Poetry for 2013 was awarded to Mary Szybist for Incarnadine: Poems [811.6 SZY]. The book was on backorder for a while, but is now on our "New Books" shelf. Mary Szybist’s richly imagined encounters offer intimate spaces and stagings for experiences that are exploratory and sometimes explosive. Through the lens of an iconic moment, the Annunciation of an unsettling angel to a bodily young woman, Szybist describes the confusion and even terror of moments in which our longing for the spiritual may also be a longing for what is most fundamentally alien to us. In a world where we are so often asked to choose sides, to believe or not believe, to embrace or reject, Incarnadine offers lyrical and brilliantly inventive alternatives. The following poem is my favorite of the ones I've read so far! I can see a 1,000 piece puzzle of a painting of "The Annunciation," and I can hear the girls free-associating while they work. This week's Poetry Friday Round-Up is coming from our neighbor to the northeast, Donna at Mainely Write. 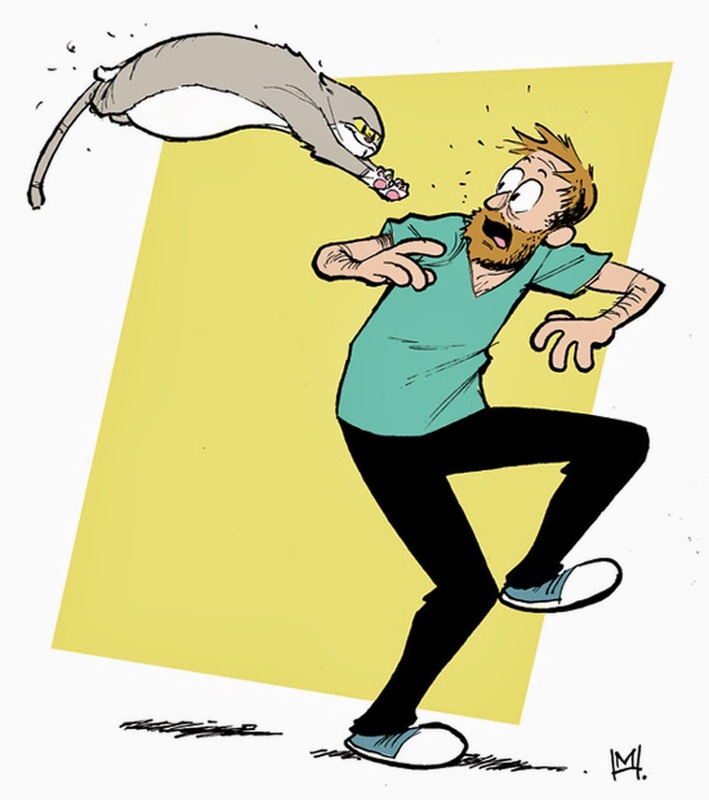 A few weeks back, NPR ran a post about a cartoonist, Mike Holmes, who owns a cat named Ella. Holmes has drawn himself and Ella in the style of several different cartoonists. One is Bill Watterson, creator of "Calvin and Hobbes." Several other examples may be seen here. Holmes has his own blog, at mikeholmesdraws.com. The Library also has a teen Anime Club that will be meeting on Thursday, January 16, at 4:30. For more information, call 432-7154 and ask for Mrs. Brikiatis. In Minnesota there's some serious snow creature building going on. You can see more of the shark, and some of the other snow creatures made by three brothers by clicking here. We had a little snow last week, and I did see a few snow people appear. If you want to make your own snow people the next time we get a storm, come borrow Snowmen: Snow Creatures, Crafts, and Other Winter Projects by Peter Cole [J 745.594 FRA], "a guide to crafting winter wonderlands includes ideas for using everyday objects to liven up traditional snowmen, inspiration for building unusual snow creatures, and a recipe section on edible snowmen." 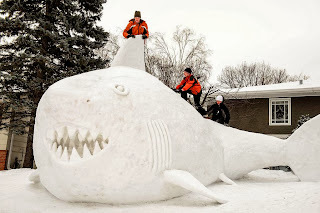 Snow shark photo courtesy @gspphoto. There's a new movie playing locally called Saving Mr. Banks. It stars Emma Thompson as P. L. Travers, the woman who wrote Mary Poppins, and Tom Hanks as Walt Disney. It's a story of how Disney was able to talk Travers into having her book, Mary Poppins, made into the film that is known as Walt Disney's Mary Poppins. I can't remember there being as much controversy over a movie "based on a true story," as there is over this one! It's really interesting to read the opposing viewpoints, and I'd recommend this article, and this one. You also might enjoy reading the interview with Thompson and Hanks. There is one adult biography readily available about Travers, Mary Poppins, She Wrote: The Life of P.L. Travers, by Valerie Lawson. I have ordered a copy, and hopefully it will arrive soon. You may want to pick up our copy of Mary Poppins [J TRA, also J AB/CD TRA], watch the Disney film [DVD MAR], then head down to the theater to see Saving Mr. Banks and come to your own conclusions. Okay, it's the Monday after the holidays and the snow days, so it's time to get serious! Some of you may remember the flamingo display we had several years ago, unfortunately, the librarian from whom we borrowed the collection has retired. 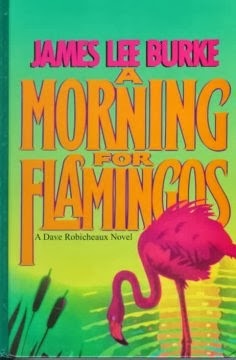 But, if you have a flamingo collection, we'll gladly put it on display to add a little color to this cold, snowy winter. Yesterday, we were only open part of the day due to snow. The time before we closed was spent checking out DVDs and thrillers to those were expecting to be spending time indoors! Unfortunately, I did not have a Poetry Friday post ready for today, but, when I got home I found the Library's copy of Good Poems, selected by Garrison Keillor [811.008 GOO], sitting right on my desk just waiting to spend the rest of a "snow day" with me. The first Poetry Friday Round-Up of 2014 is taking place at I Think in Poems. Before coming down to the Library today, give us a call, or check the closings on WMUR. Be safe. ...to just believe in what we can be. The Library is closed today. See you tomorrow!